The Rig Shop was formed over 25 years ago by Harry James. Brought up in Mallorca Spain, Harry regularly sailed on yachts of all sizes, making the crossing between Spain and the UK several times a year before he was 14. At the age of 17 Harry joined the Merchant Navy spending 5 years travelling the world. Between 1981 & 1986 Harry worked with Peter Morton Yacht Services as a qualified rigger before teaming up with Sparcraft. During his time at Sparcraft Harry assumed responsibility amongst other things, for servicing the Admiral's Cup & Whitbread Round the World Fleets. Travelling to each stop over Harry provided the onsite technical backup required throughout these prestigious events. He then went on to become the Rigging Manager for Sparcraft UK based in Lymington. During his years at Sparcraft Harry spent a considerable time researching and developing new materials which could be used in rigging. 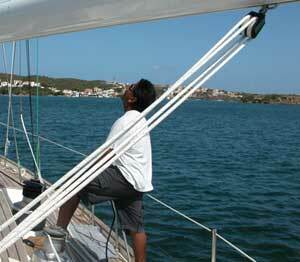 The result of his efforts were two ropes, Dyneema and Vectran, that are now commonly used on yachts of all sizes. In 1991 Harry left Sparcraft and founded The Rig Shop, giving him the freedom to exercise his talent for innovation and high quality customer service. The Rig Shop's success has been driven by its comittment to delivering continuous improvement in the quality of the products and services it provides. Twenty five years later, Harry's passion and "can do" attitude is reflected in an impressive team of professionals who share his enthusiasm and values.